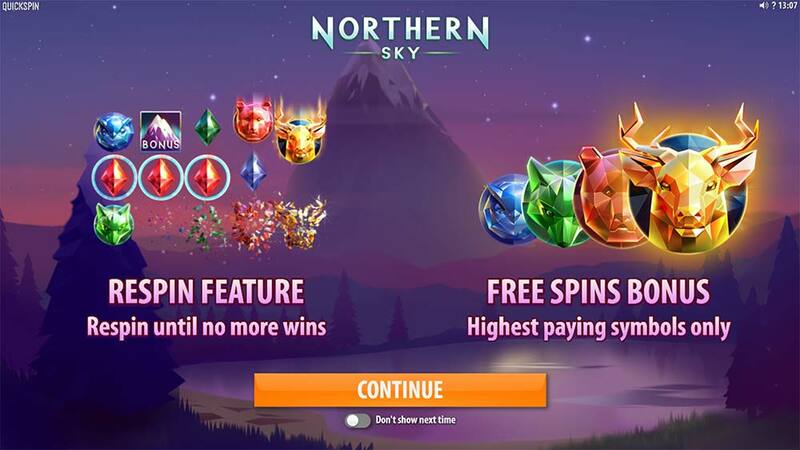 Play the New Northern Sky Slot From Quickspin Before It’s Official Release Date! 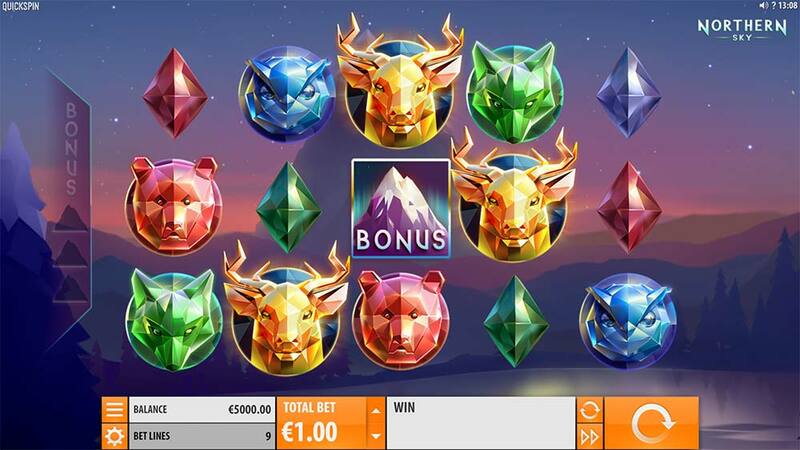 LeoVegas Casino has recently added the new Quickspin slot titled Northern Sky to their casino, this is well ahead of the official release date on the 13th February 2018, so if you want to check this slot out immediately for real or play money Leo Vegas is your casino of choice. As the name suggests Northern Sky is set in the backdrop of a rural snowy Scandinavia with all of the various high and low paying symbols being formed from coloured crystals with various animals used for the highest paying symbols. 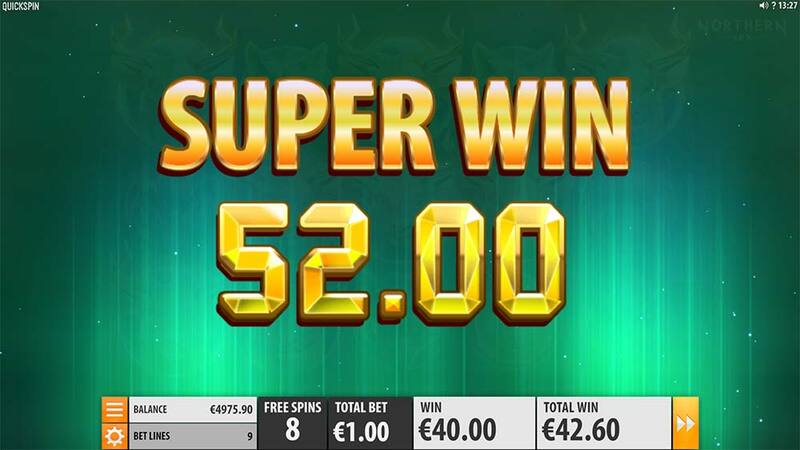 Using a regular 5×3 reel layout this slot comes with just 9 active paylines and seems to offer a slightly higher variance style gameplay from their usual releases which is a pleasant surprise. The main features of this slot are an Avalanche-Style tumbling reels mechanic, similar to slots such as Gonzo’s Quest (NetEnt) with the twist that the winning symbols are held in place on the reels with re-spins granted along with a free spins bonus round. The main focus of the base game is to collect 3 of the special Bonus symbols on the reels, this can be done in 1 single spin or over the course of several re-spins if more winning combinations are formed. 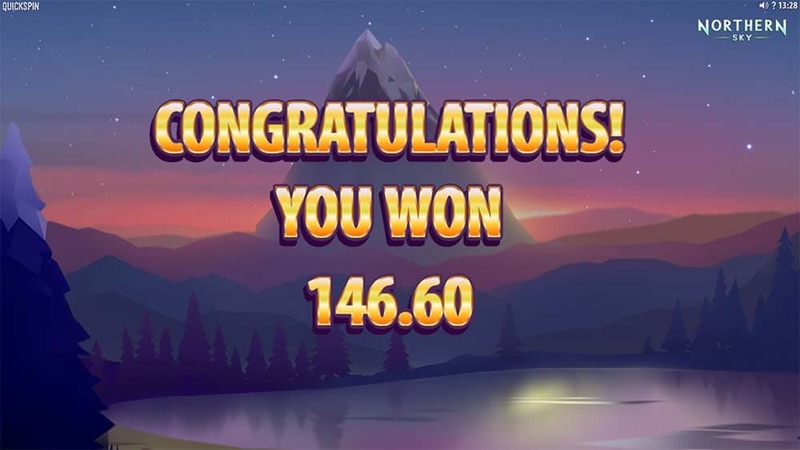 The free spins round is where things really warm up with all of the lowest paying symbols getting removed from the reels making it much easier to score wins with the high paying animal symbols and start the re-spins. You can check out all of Northern Sky’s special features in the gameplay video shown below. If any wins are formed in the base game or bonus round these winning symbols are held in place (highlighted blue) and a re-spin is granted, any further matching symbols that land on the reels repeats this process until no new wins are created. To trigger the free spins you need to collect 3 of the special Bonus symbols, this can be during 1 spin or successive re-spins and awards you with 10 free spins. 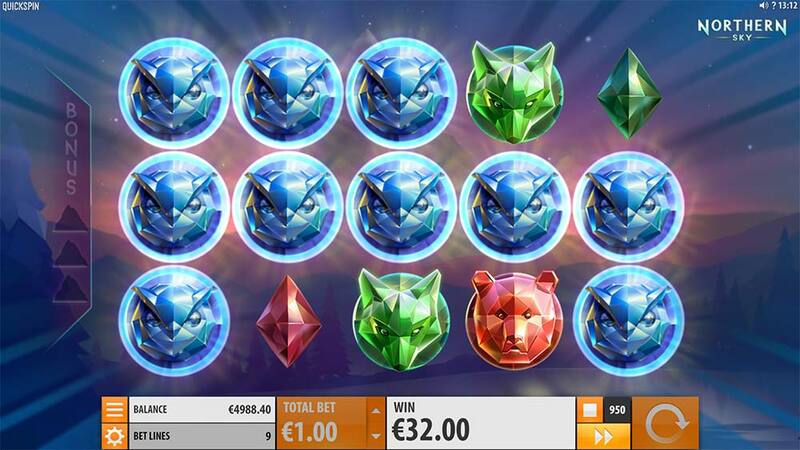 During the bonus round all of the lowest paying crystal symbols are removed from the reels leaving you with just the high paying animal crystal symbols with the same re-spin mechanic at play for wins formed. 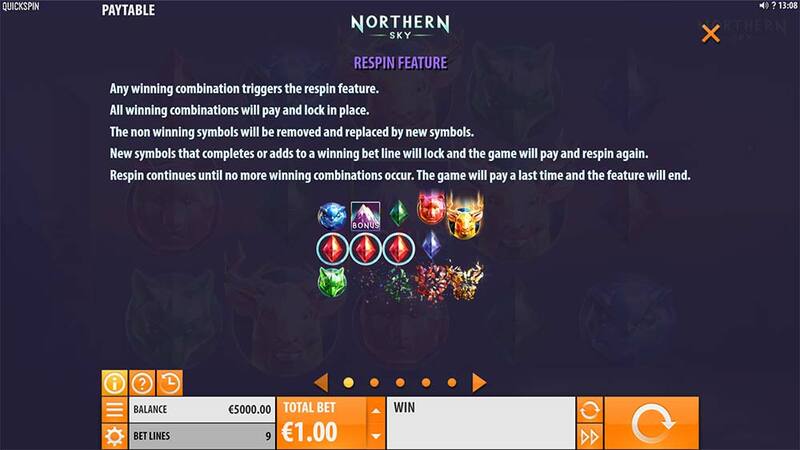 Northern Sky is definitely an interesting slot release from Quickspin, with just 9 paylines and the re-spin feature this seems to be quite a volatile machine that is capable of some very decent wins. In our playtests the bonus rounds ended with results in the range of 20x up to around 150x, with plenty more potential is any of the 5 of a kind wins are formed. The interesting area of this slot is that the wins are paid out after each re-spin so if you collect more symbols gradually and gain extra re-spins the wins can really accumulate. Definitely not a slot for everyone given the volatility, but definitely worth checking out if you are a fan of tumbling reel slots or higher variance offerings.